Panic Bars: Why Are They So Important? If you are a child or parent of a child growing up in the 90s, you probably remember that fateful scene in the Disney movie The Lion King when Simba and Mufasa are caught in a wildebeest stampede. We all know what happens and don’t want to revive that heart-wrenching moment. At an early age, many of us learned the consequences of a stampede, but hopefully, have never faced one ourselves. The panic bar was created so that no one would have to experience such an event. A panic bar, also known as panic exit device, crash bar, push bar, etc., is a type of door opening mechanism: A long metal bar that you push to open a door. A panic bar can be spring-loaded, have an attached alarm, but always has to be pushed to open the door. A panic bar can also be “dogged.” Dogging is when a door fitted with a panic bar can be pushed open by pushing anywhere on the door, not just the panic bar. Many businesses dog their door during business hours. Unfortunately, as with many modern advances, the panic bar came into being due to tragic circumstances. In 1883, tragedy struck the hearts of many in Sutherland, England when 183 children died as they were trying to exit a building because of a fire. The door at the bottom of the stairwell was bolted shut, so those inside could not get out. Tragedy also struck a few years later, across the pond in Chicago, when 605 people died in the Iroquois Theater Fire because iron gates blocked the exits. (Patrons were always locked in the theater to prevent them from leaving, and non-paying patrons from sneaking inside.) Most in the theater died due to the fire, but some were trampled to death by the other panicked patrons. Again, in Ohio 5 years later, 174 people died in the Cottonwood School fire. After the tragedy in Sutherland, England, Robert Alexander Briggs invented the panic bar or bolt. In 1892, Briggs gained his UK patent, and change was underway. Henry H. DuPont also developed his version of a panic bar shortly after the Iroquois Theater Fire in Chicago. Carl Pinzler was to attend the event at the Chicago theater that night, but fate intervened and he had to miss the event. Pinzler contacted DuPont and by 1908 the panic bar was released and available. Due to the scope of these catastrophic events, more and more people began installing the new panic bars in their buildings and, by the end of the 20th century, building code called for all public buildings to have exits designed for use in case of a fire. Panic bars were installed on these emergency exits because the mechanism of the panic bar operated so fast that, in case of an emergency, the doors would open quickly without slowing down the person or people opening the door. The panic bar lessened the chance of a human stampede and allowed those exiting the building to get out of harm’s way quickly. Have you ever thought about why the panic bar is so important? Neither had this blogger until researching for this post. Panic bars are something that we most likely come into contact with every day as we go about our daily lives, running errands, and going to work. Though the circumstances are tragic that gave us these safety advancements, we can be thankful that we live in a world where these safety precautions are required for all public buildings. Are you a business owner or a property owner of a public building? 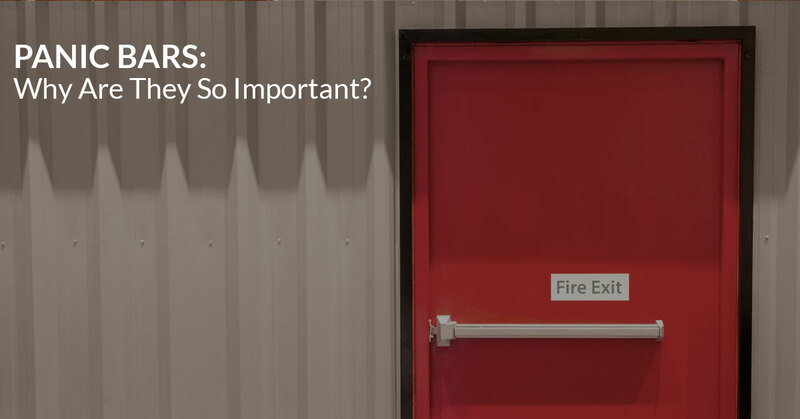 Are all your fire exits up to code? Do you need to increase your security? Call Affordable Locksmith of Spring and The Woodlands area! We are licensed locksmiths who are able to assist with all your residential, commercial locksmith needs and more. Our locksmiths have been in the business for over 10 years, with over 10 years worth of happy clients. We’d love to help you keep your home, business, or vehicle safe with quality and effective security. Contact our locksmiths for more information as to how we can help you! Locked out of your Spring or The Woodlands home, business, or car? Call us! We will get in contact with you within 15 minutes of your call! Like our blog? Stay tuned for more posts about security, fun facts about keys, news about our business, and more! Learn More About Affordable Locksmith of Texas!